Steel Crest air filter vents are available in six beautiful designs. This decorative return air grille can be finished in you choice of six different custom finishes. Air filter vents are a beautiful, yet functional, way to minimize dust in your home or office. These decorative return air grilles almost look like a work of art when installed. Air filter vents arrive with matching hardware and a reusable filter. The filter is easily changed by taking off the knob to open the door, cleaning/replacing the filter, and screwing the knob back on. Decorative return air grilles are crafted with 18 gauge steel for the frame and 14 gauge steel for the faceplate making for a strong filter grille. All of these air filter vents are made in the US. Return air filter vent grilles recess into wall 1.5" to 1.75"
Tip: To order the right size, measure the actual hole and order that size grille. For example a 12" x 12" hole would require a 12" x 12" grille. All sizes are width by height unless otherwise requested. The faceplate will then be larger as stated above. Important: Decorative return air grilles, both standard size and custom size, will take 5 to 8 weeks to be manufactured and shipped. There are rush shipments (2 to 4 weeks) available for an extra charge (please call for information). All decorative air vent covers are special order, non-returnable and cannot be canceled once payment is received. We can send color finish samples for a small deposit which will be refunded when the samples are returned. Please contact us with any questions. Be sure to take a look at all of our Steel Crest products. 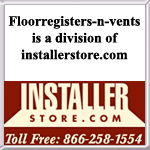 You can find registers or standard returns to match for your floor or wall. These decorative return grilles bring both form and function to your space. Place your order today!